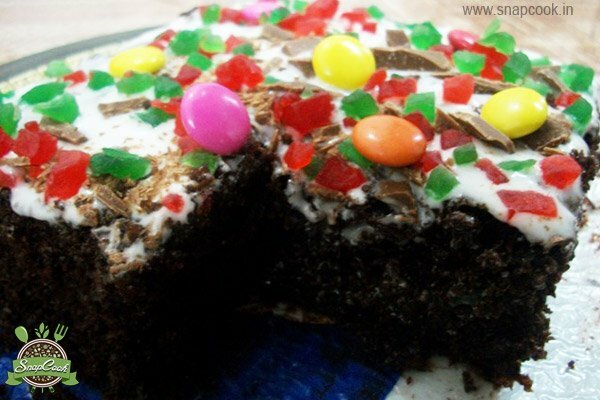 Eggless Curd Cake is the best option for the people specially for vegetarians who always have a craving of eating sweet like cakes.It is easy and can be cooked in few minutes. You can prepare this in kids’ birthday parties as well. Preheat the microwave for 10 minutes. Meanwhile, sieve maida, cocoa, soda, baking powder and coffee all together and keep aside. Combine the sugar, oil and curd in a deep bowl and beat well in one direction using a whisk. Now add the sieved flour mixture and mix gently with the help of spatula for 3-4 minutes till it gets smooth and light. The batter should be of medium consistency. Add milk and vanilla essence and mix it well. You can add some dry fruits or cherries in batter and put some into bowl before placing the batter. Now add sugar in freash cream and mix it well using a whisk. 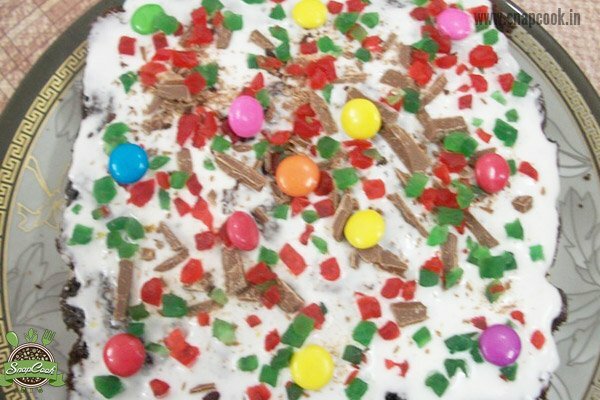 Decorate it with gems, chocolate chips and cherries. Enjoy your eggless curd cake. I used bread wrapper for lining microwave bowl instead of Step 8. The cake came out easily and the bowl remained clean as well. Add a few drops of glycerine while beating the cake batter to make it spongier n softer.